NEW YORK TIMES bestselling author Neil Gaiman's transcendent series SANDMAN is often hailed as the definitive Vertigo title and one of the finest achievements in graphic storytelling. Gaiman created an unforgettable tale of the forces that exist beyond life and death by weaving ancient mythology, folklore and fairy tales with his own distinct narrative vision. A being that has existed since the beginning of the universe, Morpheus rules over the realm of dreams. 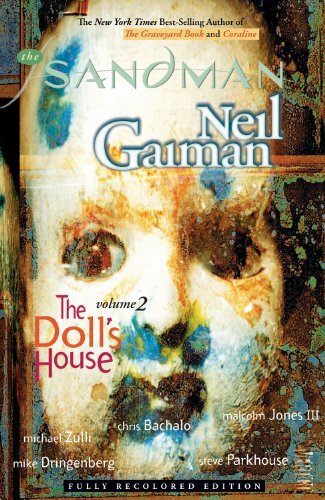 In THE DOLL’S HOUSE, after a decades-long imprisonment, the Sandman has returned to find that a few dreams and nightmares have escaped to reality. Looking to recapture his lost possessions, Morpheus ventures to the human plane only to learn that a woman named Rose Walker has inadvertently become a dream vortex and threatens to rip apart his world. Now as Morpheus takes on the last escaped nightmare at a serial killers convention, the Lord of Dreams must mercilessly murder Rose or risk the destruction of his entire kingdom. Collecting issues #9-16, this new edition of THE DOLL’S HOUSE features the improved production values and coloring from the Absolute Edition.